For the latest equestrian news log onto the Newbridge College Equestrian Facebook page. Newbridge College has a very active equestrian club which participates at all Inter schools equestrian activities principally show jumping and hunter trials. We host a leg of the Interschool’s League yearly in late September and run our own Horse Show in May each year. The second level schools’ show jumping league has been established over the last 30 years and its popularity is still growing. The league starts in September and finishes at the final in April with up to 30 competitions held all over the country throughout the year. Newbridge College try to attend all these events. Teams travel from the four corners of Ireland to compete and there can be up to 40 teams competing. The College has been involved in the league since its inception. The Senior Team competition is the principal event with jumps up to 1.05cms. Teams jump 2 rounds of fences and those who finish on 0 faults qualify for the jump off round to decide the placing’s. Those who win or are placed receive points which will eventually decide the League winners. The Open level league is sponsored by TRI Equestrian on the Curragh. For this the school’s 6 best results over the season are counted towards the League Final held at the end of the season. This can be very exciting as the result can change dramatically since points and a half are awarded at the final, which means that the school going in to the competition final in the lead can be overtaken by another school scoring well on the day. Most venues also hold Novice competitions which compete up to 85cms. Newbridge are very lucky to have very strong Novice riders who won 6 competitions and placed another 6 times last season. Newbridge College host a leg of the TRI Equestrian Interschools League yearly in late September in Coilog Equestrian Centre. Newbridge College have been running this competition for 17 years and have a great relationship with riders and chef d’equipes from the visiting schools and this has become a very social event after the summer break. This is also a chance for our own Principal Mr Pat O’Brien to watch the action, support the club members and of course present the prizes. Previous to 2013 Newbridge College took home 7 winning titles in the Show jumping League when it was known as the Hoofprints League. 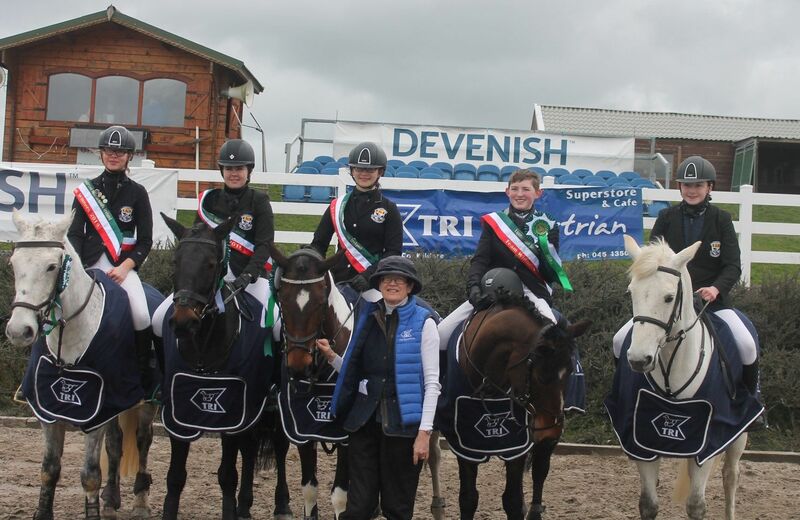 In 2013 Newbridge Won the TRI Equestrian league with riders: Lauren Heffernan, Hannah Sutton, Meadhbh Brassil and Aoife Murphy. Winning Attendance and Best Turned Out Leagues. Again in 2015 Newbridge Won the TRI Equestrian League with riders: Luke Heffernan, Sarah Behan, Caoimhe Sweeney and Karen Casey again winning Attendance and Best Turned out league. Jack Ross won the Senior Show jumping League. In 2016 Newbridge were runners up in the league with riders: Caoimhe Sweeney, Amy Carroll, Caragh Sweeney and Daniel Fitzgerald. Daniel Fitzgerald won the Senior Show jumping league. In 2017 took 3rd place in the league winning Attendance and Tack and Turnout. Caragh Sweeney won the Senior Show Jumping League. In 2018 Newbridge College won the league with the team of Caragh Sweeney, Leah Heffernan, Niamh Flinter and Max Ross. The Open Individual competition is also held with the same rules applying. This is usually a one round speed round, which is very exciting to watch. Newbridge competitiors have won this individual league twice with Alyssa O’Neill in 2011 and 2012 and for the past four years with Jack Ross in 2015, Daniel Fitzgerald in 2016 and Caragh Sweeney in 2017 and Niamh Flinter in 2018. There has been a new edition to the league 3 years ago with the introduction of the Horse Sport Ireland 1.10cms Premier Class. Qualifiers are held throughout the year at 15 venues and riders must qualify to ride at the final. Jack Ross was the 1.10cms Premier class winner in 2018. Our school equestrian activities are not just confined to show jumping, although that would be the major part of the school year. We also participate in the All Ireland Inter schools Hunter Trials competition and for this you need to attend hunter trials or hunt regularly. Since our members participate in various different equestrian activities we always have a large entry for this. Over the last few years Newbridge teams have won this competition in 2013 and again in 2017 with sisters Amy and Sophie Carroll and Emily O’Brien. Emily then went on to be Senior Individual Champion. We also came 2nd with riders Rachel Ross, Conor Cassidy and Charlie O’Dwyer. Unfortunately due to bad weather the Championships were not run in 2018. The Newbridge College Horse Show takes place early in May each year. With 60 Pony classes including Derby, Working Hunter, Showing, Fancy Dress and Dog Shows. The whole school is involved in this day and has a brilliant community feel. At this show there are 2 classes confined to college pupils. These mark the end of the equestrian club year and are hotly contested as they decide who will be the recipients of the Novice and Open College Cups. In 2018, the Open Cup was won by Max Ross and the Novice Cup by Sophie O’Neill. In 2018 as the winners of the league, Newbridge College qualified to send a team to the Bluegrass Interschools Showjumping Competition in Balmoral, a competition which is only in its 2nd year. Caragh Sweeney, Leah Heffernan, Niamh Behan and Max Ross travelled to the show. The competition took place in the International Grass Arena and was a two phase competiton with one round against the clock for each competitor. After 8 great rounds and with much excitement Newbridge took 2nd place. In 2017 The team of Caragh Sweeney, Leah Heffernan, Sophie Carroll and Niamh Flinter came 5th. This is a fantastic competition and we would love to qualify each year to send a team. Newbridge College have a great history in Hickstead, and in the Summer of 2018 Newbridge won the Senior’s Showjumping Competition. 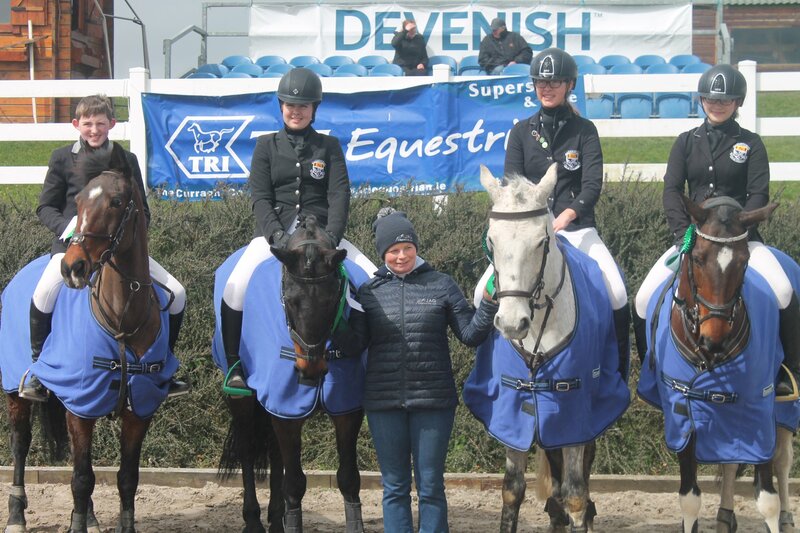 Newbridge have been attending this event for over 2 decades and it was fantastic for the school and all the riders that travelled to bring the title back to Ireland and Newbridge College. 9 riders travelled to Hickstead, Caragh Sweeney, Leah Heffernan, Niamh Flinter,Max Ross, Jack Ross, Niamh Behan, Rachel Ross, Lucy Ross and Lola Gabor Sweeney. The team of Caragh, Leah, Niamh and Max qualified to jump in the main arena and after a super jump off the team was placed first. In the summer of 2017 the team of Niamh Behan, Max Ross and Charlie O’Dwyer placed 2nd in the Junior Competiton. And in the Summer of 2016 both Junior and the Senior teams took 2nd place with Daniel Fitzgerald, Caragh Sweeney and Rachel Ross and in Juniors Leah Heffernan, Sophie Carroll and Leah Ross. The many equestrian activities throughout the year demand commitment, not just from the members but from the members’ parents or guardians as these are the people who transport horses and ponies to events, are unpaid grooms and cheerleaders and are there to be moaned at and given out to when everything goes pear shaped! But they are also on hand to praise and to join in the celebration of a round well done, and at the end of a long day they have the dubious pleasure of driving the sleeping rider and pony home in the dusk. The club is run solely by parents and they have become great friends and support each other through all the hard work of keeping the Equestrian Club going with the fantastic support of all the school but especially our Principal Mr Pat O’Brien and our two vice principals Mr Neville Conroy and Ms Alison Bradshaw who now attend events and present rosettes.